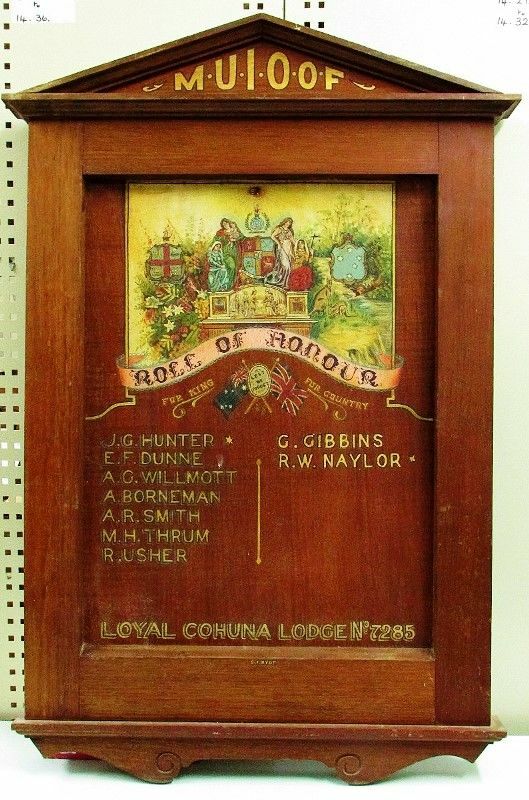 The wooden honour roll commemorates members of the Loyal Cohuna Lodge who served in World War One. The Manchester Unity Independent Order of Oddfellows (MUIOOF) Honour Roll was unveiled on the 7th September 1916 and lists Cohuna members who enlisted in World War One. The first name on the roll was Private J.G Hunter who was also the first soldier from the district killed in the Gallipoli landing. Bendigo Advertiser, 12 September 1916. M. U. I. O. O. F.